“Well! I’ve often seen a cat without a grin,” thought Alice; “but a grin without a cat! It’s the most curious thing I ever saw in all my life!” So can an object be separated from its properties? It is possible in the quantum world. In an experiment, neutrons travel along a different path than one of their properties – their magnetic moment. This “Quantum Cheshire Cat” could be used to make high precision measurements less sensitive to external perturbations. 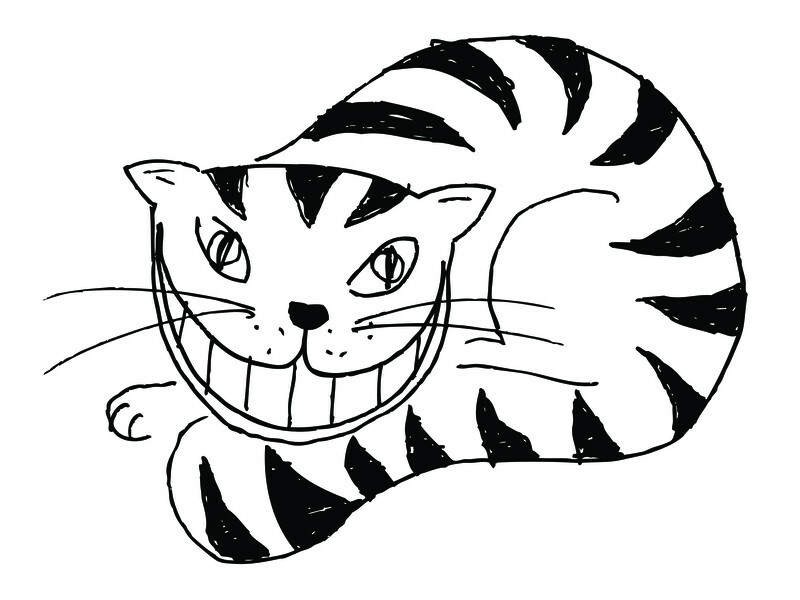 Artistic depiction of the quantum Cheshire Cat. 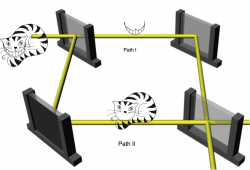 Inside the interferometer, the Cat goes through the upper beam path, while its grin travels along the lower beam path. Figure courtesy of Leon Filter. First, a neutron beam is split into two parts in a neutron interferometer. Then the spins of the two beams are shifted into different directions: The upper neutron beam has a spin parallel to the neutrons’ trajectory, the spin of the lower beam points into the opposite direction. After the two beams have been recombined, only those neutrons are chosen, which have a spin parallel to their direction of motion. All the others are just ignored – this is called postselection. The beam contains neutrons of both spin directions, but we only analyse part of the neutrons. These neutrons, which are found to have a spin parallel to its direction of motion, must clearly have travelled along the upper path – only there, the neutrons have this spin state. This can be shown in the experiment. If the lower beam is sent through a filter which absorbs some of the neutrons, then the number of the neutrons with spin parallel to their trajectory stays the same. If the upper beam is sent through a filter, than the number of these neutrons is reduced. Measurement of the population in path I and II using an absorber. The intensity is plotted as a function of the relative phase χ. The solid lines represent least-square fits to the data and the error bars represent one standard deviation (a) An absorber in path I; no significant loss in intensity is recorded. (b) A reference measurement without any absorber. (c) An absorber in path II: the intensity decreases. These results suggest that for the successfully post-selected ensemble, the neutrons behave as going through path II. Things get tricky, when the system is used to measure where the neutron spin is located: the spin can be slightly changed using a magnetic field. When the two beams are recombined appropriately, they can amplify or cancel each other. This is exactly what can be seen in the measurement, if the magnetic field is applied at the lower beam – but that is the path which the neutrons considered in the experiment are actually never supposed to take. A magnetic field applied to the upper beam, on the other hand, does not have any effect. Measurement of the spin in path I and II, applying small additional magnetic fields. The intensity is plotted as a function of the relative phase χ. The solid lines represent least-square fits to the data and the error bars represent one s.d. (a) A magnetic field in path I; interference fringes appear. (b) A reference measurement without any additional magnetic fields, where due to the orthogonal spin states no interference fringes are observed. (c) A magnetic field in path II; interference pattens do not differ significantly from reference measurement, suggesting the neutrons’ spin component travels along path I. By preparing the neurons in a special initial state and then postselecting another state, we can achieve a situation in which both the possible paths in the interferometer are important for the experiment, but in very different ways. Along one of the paths, the particles themselves couple to our measurement device, but only the other path is sensitive to magnetic spin coupling. The system behaves as if the particles were spatially separated from their properties. 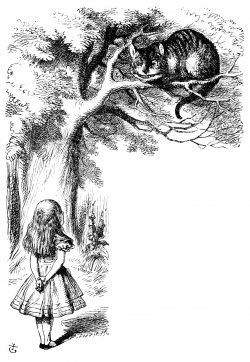 The idea of the Quantum Cheshire Cat was first developed by Prof. Jeff Tollaksen and Prof. Yakir Aharonov from the Chapman University. An experimental proposal was published in 2. The measurements which have now been presented are the first experimental proof of this phenomenon. The experimental results have been published in the journal “Nature Communications”.